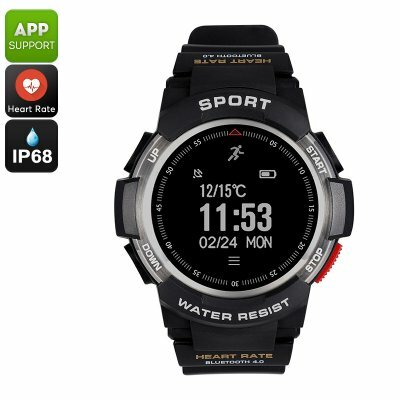 Successfully Added No.1 F6 Bluetooth Smartwatch - Pedometer, Heart Rate Monitor, IP68 Rating, iOS and Android App, Notifications (Silver) to your Shopping Cart. No.1 are back with their new smartwatch, the F6. This is an outdoor smart watch with a rugged exterior and waterproof protection. With its Bluetooth connectivity, fitness tracking pedometer and heart rate sensors, it's the perfect option for those users wanting a durable low-cost solution to tracking fitness. This smart watch can also help you track your sleep quality and will remind you if you've been sat still for too long with its sedentary reminder. So if you want a waterproof rugged solution to monitoring your fitness and don't want to break the bank the No.1 F6 is for you.